How far is that star? Despite huge advances in technology, astronomers have always struggled with the basics of celestial geography. That ended today when the European Space Agency (ESA) released its long-awaited Gaia Archive, which reveals the exact distances and motions of the closest 1.3 billion stars to our solar system, plus data for hundreds of thousands more. Astronomy has changed forever. Why, you may ask? 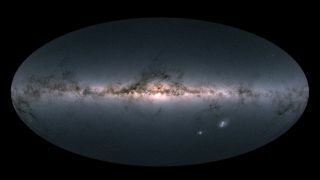 Using those the exact positions, colors, motions, and brightness of stars, astronomers at ESA have been able to create a 3D map of the Milky Way that accurately shows how far stars are form us, but also a lot about their nature, and how they’re moving around our galaxy. Gaia also mapped the proper motion of 14,000 asteroids in our solar system, revealed how fast seven million stars are moving either towards or away from us, and mapped the orbits of 75 globular clusters and 12 dwarf galaxies that orbit the Milky Way. How important is the Gaia data? A satellite that for almost five years has been anchored in an orbit of the sun about 1.5 million kilometres from Earth, the ESA’s €750 million (US$915 million) Gaia space observatory has been on a mission to produce a highly detailed star chart of our Milky Way and its neighboring galaxies that is 10,000 times more detailed than what we had before. Astronomers know much about star formation in general, and a lot about some individual stars. However, they have always struggled to pinpoint exactly how far away they are from us, and how they move. Stars more or less look the same in the night sky, but they do differ in brightness. One star might be brighter because it’s very close, while another might be bright because it’s far away, but much larger. "Gaia is rotating across the sky making one large circle every six hours, and it spins and covers the sky every two months," said Günther Hasinger, the Director of Science at the ESA. "In the five year mission we'll get 29 images of the whole sky." The new data includes positions and brightness for nearly 1.7 billion stars, and the distances, proper motions and colors for 1.3 billion of them. "It's not a photograph, it's made from the positions of 1.3 billion stars," said Anthony Brown, Gaia Data Processing and Analysis Consortium at Leiden University, of the first accurate map of our own galaxy. "You should download the high-res version from ESA and go to a dark place and study it." In the image it's possible to see the plane of the Milky Way and its dust bands, and over a billion stars. "It's so hi-res that that every single dot we have a distance for," said Brown. Gaia stands for Global Astrometric Interferometer for Astrophysics. Astrometry is the science of measuring the positions and movements of stars. The core problem is that it's very difficult to study the distance between two objects when you’re on one of the. Luckily, the Earth travels about 584 million miles / 940 million km in one year on its orbit of the sun. So, astronomers measure exactly where a star appears to be in the night sky twice, six months apart, therefore getting a measurement from two different places in space. Knowing the distance from the Earth to the sun is always roughly the same, astronomers then use triangulation. The closer the star, the more it will appear to move. This is called stellar parallax. However, it only really works for stars that are close to us. So, astronomers have sent various satellites into space to take measurements from greater distances. The most famous was Hipparcos (named after the founder of trigonometry), which spent three and a half years in the late 1990s accurately measuring the positions of 118,000 stars, and getting a general position for 2.5 million. The Hipparcos catalogue is still used to point ground-based telescopes and to navigate spacecraft. Gaia’s scope is far wider than Hipparcos, and its tech is much more accurate. Its billion-star catalogue is from today the definitive star catalogue, if it wasn’t already. What tech is Gaia using? Gaia’s instruments are thousands of times more sensitive than Hipparcos’. It is able to detect stars down to magnitude 20, which is around 400,000 times fainter than the human eye can see. Flying on Gaia is a video camera – the biggest astronomical camera ever built – and a couple of telescopes that sweep across the whole of the sky as the satellite slowly spins. The light they collect is funneled to three instruments, and its astro-metric detector records stars as they cross its field of view, calculating positions, proper motion and parallax. Meanwhile, Gaia’s radial velocity spectrometer susses out how fast a star is moving towards or away from Earth, and its photometric instrument collects data on the color and brightness of each star. Gaia is filming each star 70 times. We now know our place in the Milky Way with unprecedented precision. With Gaia’s data, astronomers will be creating models of exactly how stars will move, and have moved, essentially rewinding and fast-forwarding time to unlock how the Milky Way developed. But however advanced Gaia may appear, it's only the beginning. The data released today took 22 months to collect, and represents only 50% of the official five-year mission's total data. And while the Milky Way is 100,000 light years across, Gaia has only been able to look to 8,000 light years. Scientists are hoping to extend the mission by at least two years, and possibly until 2024, to get even more precise measurements.